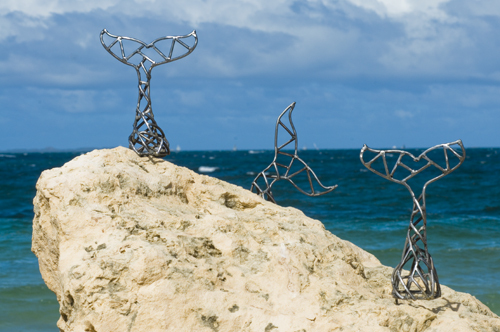 Whales have returned to Fremantle’s Bathers Beach but this time as artworks and not to be slaughtered. In the 1800s the beach housed a Whaling Station and the still open Whalers Tunnel underneath the Roundhouse reminds us of that. W.A. artist Sarah Wilkinson installed her Flukes artwork on the rocks near the South Mole as part of the Sculpture@Bathers show that will run till Sunday March 29.